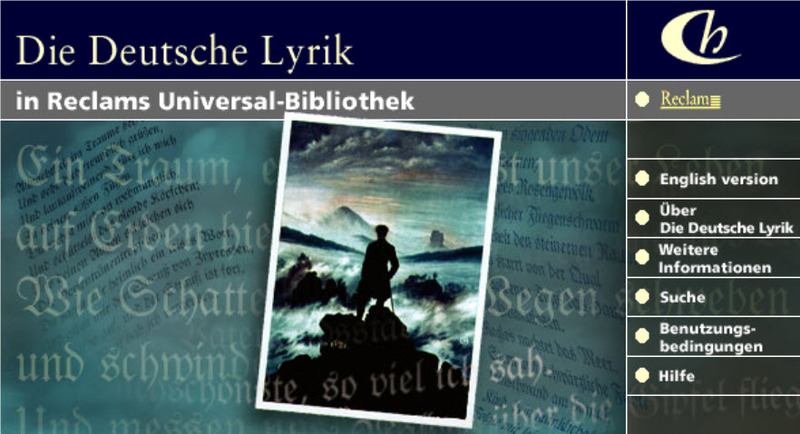 Die Deutsche Lyrik in Reclams Universal-Bibliothek covers almost 500 years of German lyric poetry and includes the work of over 500 authors from the 15th to the 20th century. Die Deutsche Lyrik in Reclams Universal-Bibliothek is published with the co-operation and support of Philipp Reclam jun., Stuttgart and covers all volumes of German poetry published within Reclams Universalbibliothek since 1945. Die Deutsche Lyrik in Reclams Universal-Bibliothek is the unparalleled publication of German poetry online. No other single collection covers the same volume of German poetry in electronic format; the collection starts with work from the 15th century and follows the development of German poetry up to the beginning of the 20th century. It is published with the co-operation and support of Philipp Reclam jun., Stuttgart and covers all volumes of German poetry published within Reclam's Universal-Bibliothek since 1945. Die Deutsche Lyrik in Reclams Universal-Bibliothek illustrates the development of German literature and language. The database allows the user to examine the reciprocal influence between poetry and politics, literary theory and philosophy. The scope and the range of the database have been enhanced through the addition of various anthologies, which also enables lesser known authors to be seen in context; it is an invaluable resource for the study and teaching of German language and literature. Die Deutsche Lyrik in Reclams Universal-Bibliothek contains the complete text of each poem and, in addition, contains material such as dedications and authorial notes which are an essential part of the original volumes. Publisher's prefaces and epilogues, introductions, editorial notes, biographies, glossaries and indices are not usually included.